Tegenungan Waterfall Bali (Air Terjun Tegenungan) which is located in Ubud (Gianyar district) is a great place to enjoy the nature in the middle of the village. It’s also close to Sukawati, the most famous-cheapest traditional art market in Bali, which is more popular among local tourist. By a car rental from Kuta it can reached in 1 or 1.5 hours. 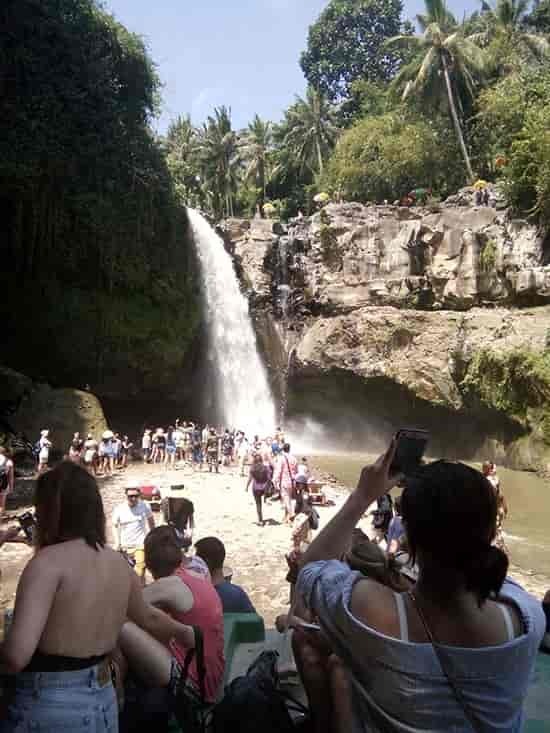 If you starts from Kuta and round up area (like what most tourist did), the waterfall is very easy to reach also. 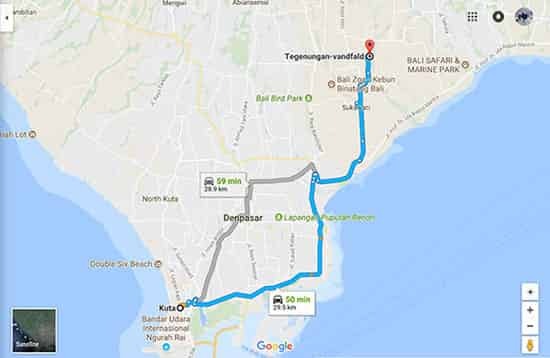 According to the Google Maps, the distance between Kuta and Tegenungan Ubud is 29.5 km, or 50 minutes driver. It is also close from Denpasar or Bali airport area, just need an hour drive, which is a good news. You don’t need to drive hours just to enjoy a waterfall in Bali…Either you are on a self driven car rental, or take a driver with you, visiting the Tegenungan is a must. Peak visit at Tegenungan is on noon time. So when you have get there on this time, please be noted it’s on busy time. This is happen in the parking area, so maybe you will get difficulty a little bit to find the parking. But don’t worry there are parking office who will help you out. This happen not only for the cars but also motorbikes, vans, buses. How much is for the parking cost? It’s free of charge. But Tegenungan waterfall entrance fee (of course) is not free 🙂 The price to entering it is 15,000 IDR. Same price applied for both adult and kid. Please be noted when you are already inside the waterfall area, as there is a place at top hill which you can visit to take a look closer to the waterfall source, there will be another ticket. It’s 10,000 IDR. 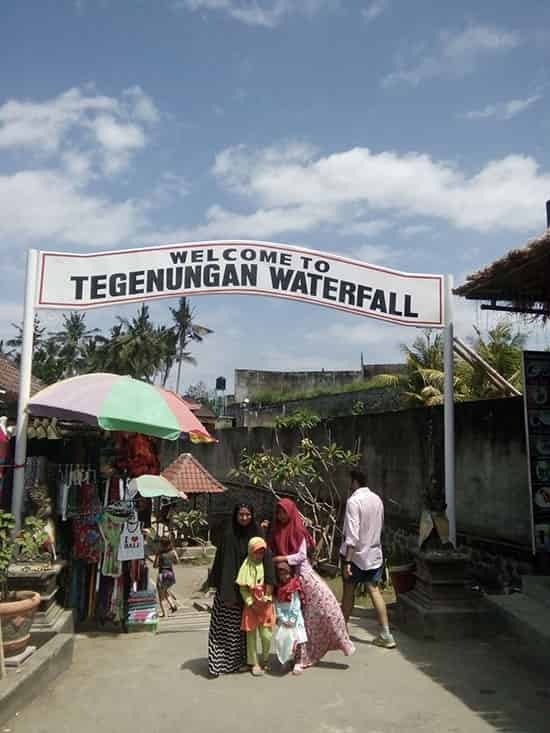 So in Tegenungan there are two charges; the first one is for entering the waterfall area, the second one is for climbing to the hill (optional). Just after buy the ticket, there are many food stall along the pathway. If you want to buy something, such as Aqua water or ice cream this place is the right one for you to buy some. Here in Tegenungan waterfall, we will see not only the waterfall itself, but also the river and nature. Although in some condition the river is muddy (when it’s raining), but when the weather is normal the river is unclouded. Many tourist in bikinis, sometime accompanied by their companion, were happy to just swimming in the driver. In the river itself we can see small fishes swimming…The official of the waterfall also did an amazing thing right on the river; by piled up stones into so many pile group. The number could be tens, or hundreds…who wants to count it..haha? They have many great warung facing directly to the waterfall. Highly advise you do this AFTER visiting the waterfall. Don’t do this BEFORE as you will hungry again, guaranteed! As informed there is a river at the bottom of waterfall. Although sometime muddy but we have seen some of the tourist were happy to swim inside. Don’t forget to take a towel with you! You can just stand at the bottom on the river, right just where the waterfall goes down. Or rent a lazy chair next to the river for 5,000 RP. Don’t forget your sun cream, or the sun will burn your skin quickly! Tak some photos. Tegenungan has some great spots to upload it on to your Instagram., ans share them to the world! If you have children with you, it it better to leave your luggage in the car, and just bring it as necessary (one small bag). Why? There are hundred of stairs that will guide you to the bottom of the hill, to meet with the waterfall. Although the tracks are not difficult, but once again; there are hundreds of stairs! To go down and up again when comeback could be stressing for a child. So maybe you need to pickaback them..
Posted in: Places to Visit.